The Dune-HD just stands out. Not only does it outperform any other media player out there, it adds new features regularly with frequent firmware updates. The Dune HD Smart D1 is feature rich and is capable of playing back just about any video or audio format available today. 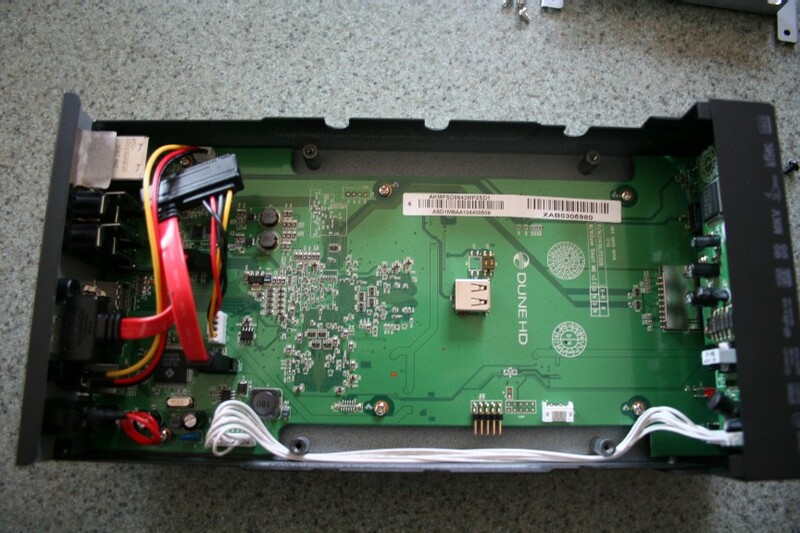 Internal HDD option: use an optional 3.5″ SATA HDD installed directly inside the player. USB slave port: easily and quickly transfer files between the HDD in the player (when installed) and a PC. The best basis for multi-component Dune HD Smart system: built-in VFD display helps to build the most feature-rich solution. Modular System Support: Dune HD Smart players allow to create custom configurations based on the primary (head) unit like Dune HD Smart B1/H1/D1 and several optional extension modules of choice, which can be combined to form an integrated player. 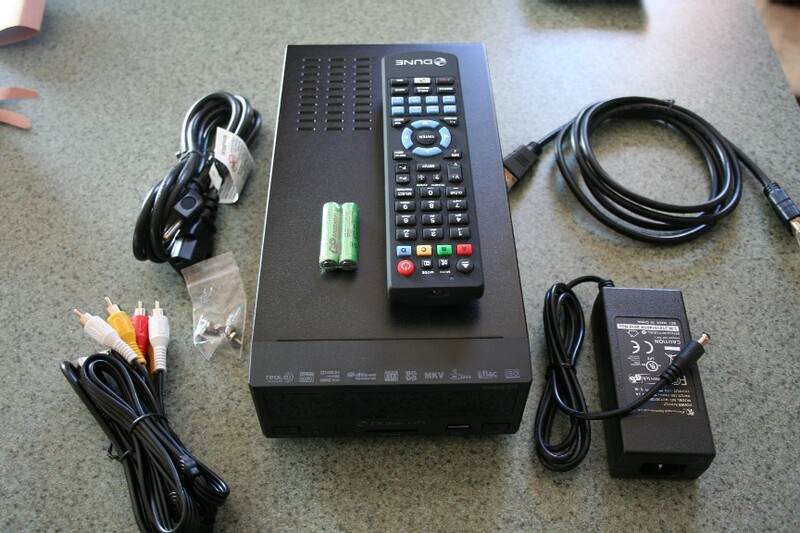 The Dune HD Smart D1 came with HDMI cable, IR Remote w/ 2 batteries, and composite cables. 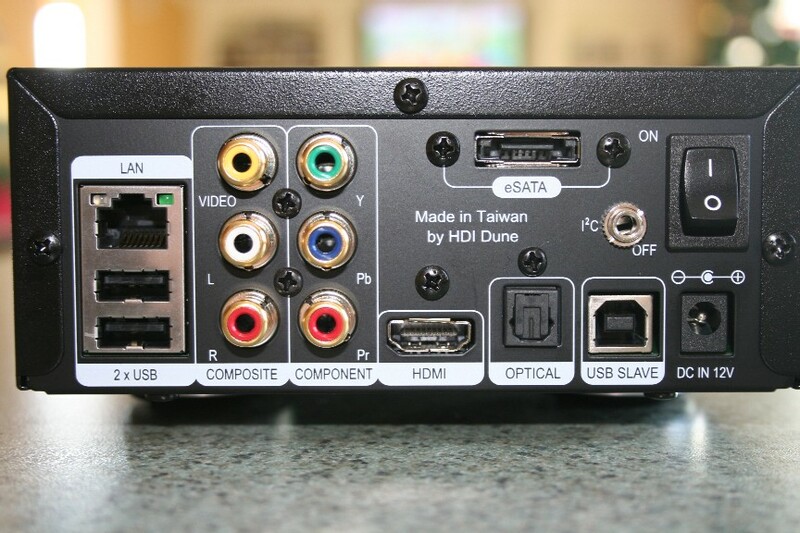 From the back you can see the LAN port (10/100/1000), 2 USB 2.0 ports, Composite/Component outputs, HMDI out, Optical, eSATA, USB Slave, and the power input. 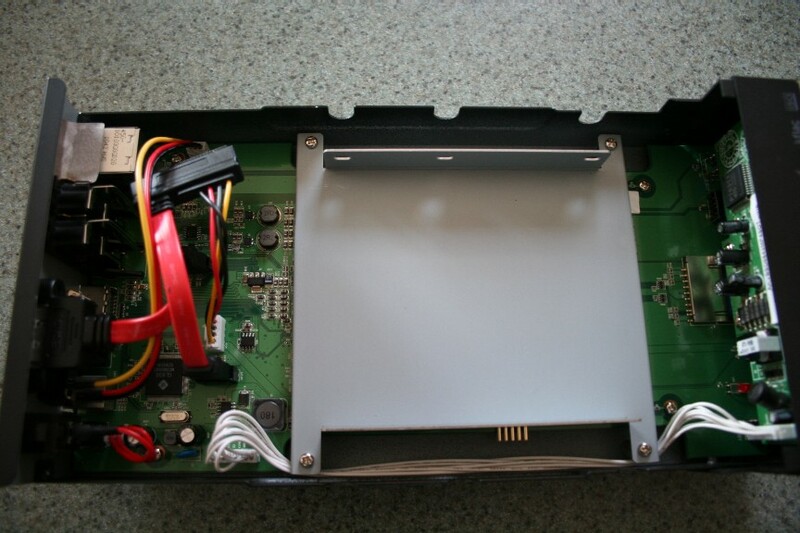 With the case removed you can see the tray for an internal drive as well as the Sata connector. Also, you can see that there is no case fan, so the D1 will operate silent. If you remove the HDD tray you can get a better view of the board. In the center of the board is a USB input. If you plan on using system storage (which we highly recommend, it is needed to add shortcuts to the Main menu as well as BD Live) this is a convenient area to attach a USB thumb drive. A simple set it and forget it. A 4GB USB thumb drive installed. As long as the thumb drive does not have any excess bulk it should fit without issue. Overall the Dune Smart D1 is a solidly built machine. It may be a little deeper then some would like but otherwise has a very small footprint. At no point did we notice any sort of over heating issues. The UI on the Smart D1 is identical to the BD Prime . Although not horrible the UI is still very basic, with a windows explorer type experience while navigating through your media. 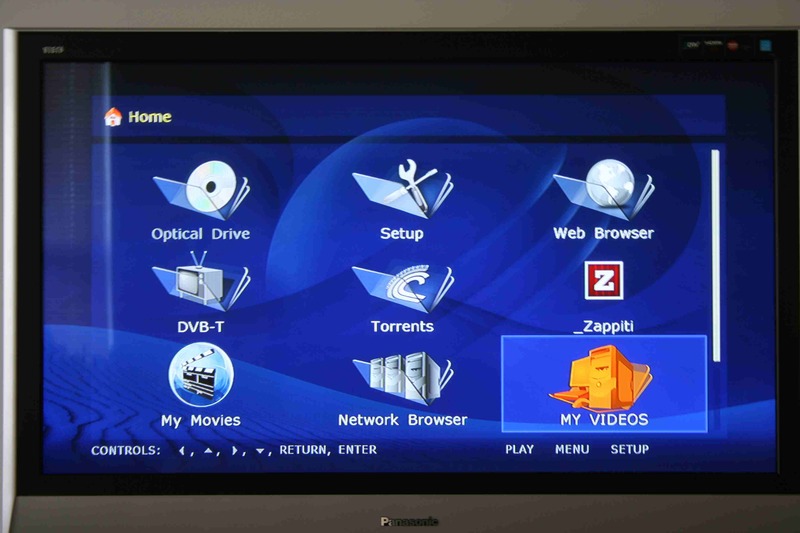 This is hopefully an area that HDI addresses as more and more media players in the market are getting away from the boring stock UI that we have become accustomed to. Simply allowing the Dune to boot directly into a 3rd party jukebox would at least provide a quick and effective solution. Navigating around the UI on the Smart D1 was the same as with the Dune BD Prime. One thing we noticed is that on a few occasions the D1 became unresponsive for a short period of time. 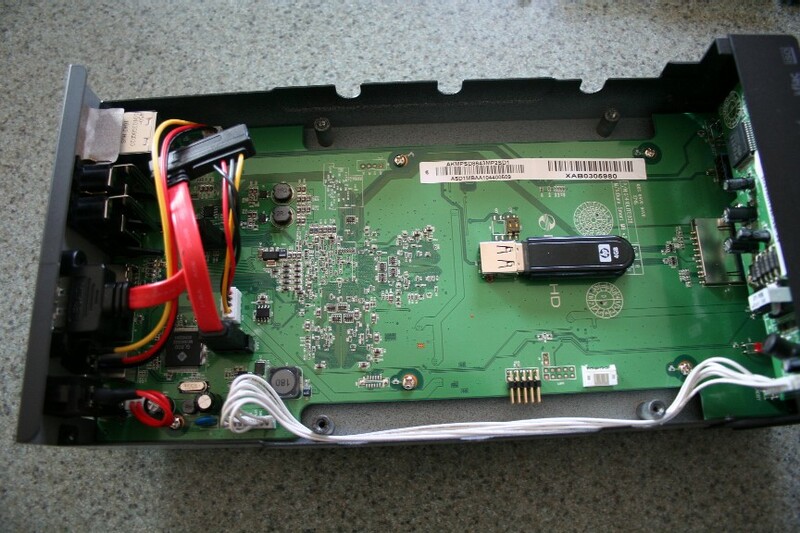 we don’t know if the unit itself became unresponsive or if the issue was possibly with the IR receiver. 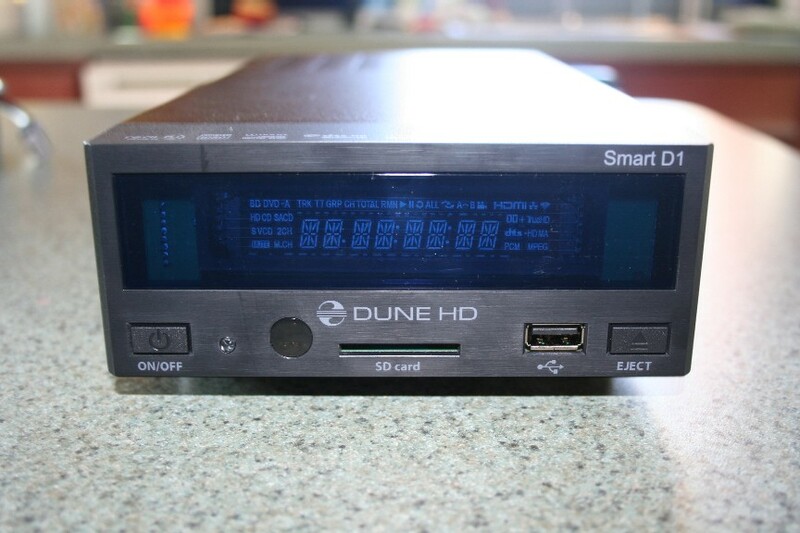 The Dune HD Smart D1 is listed as Gigabyte but it is not recommended to use this. This is the same issue that plagues the PCH C-200, however unless you are transferring files to/from the Dune over the network 10/100 is plenty fine for streaming media. As with the BD Prime testing out network performance over smb , we did not have any issues playing back all our high bitrate content on the Smart D1. We did have Fast SMB enabled and I believe it is recommended that all users who play content over the network enable this feature in the settings. We were disappointed that mkv chapter support has still not been addressed, as this should be a very basic feature to implement and one that many other players on the market supports. That combined with support for forced subtitles in mkvs (which slowly players are starting to support) would provide a complete solution for the many mkv users out their. Overall once again the Smart D1 hit a home run playing back my various test files. When it comes to online content there is currently very little offered. We noticed a new icon showed up recently on the Main Menu called Kartina.tv which we had never heard of (from reading around it appears to be a site for accessing Russian TV. Just as with the Dune BD Prime the Smart D1 lived up to expectations. 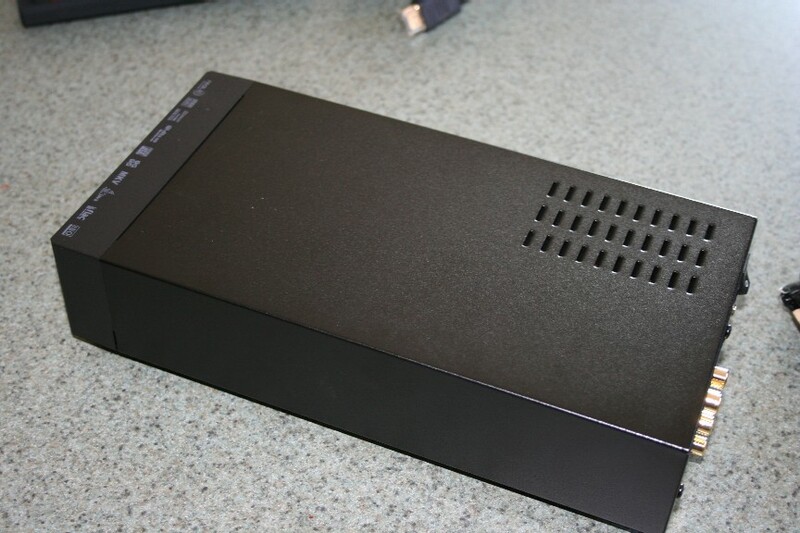 From a hardware standpoint it is very well constructed, fanless, and quiet. Undoubtedly when it comes to local video playback, the Smart D1 not only does it but it does it well, and we would say that for local video content the Dune is amongst the best out there. Like many of the other media players out there music and photos is a weak spot, and if that is an important area then I would recommend looking at the Apple TV 2 . With the expanded lineup across a variety of price ranges this should as well open up the Dune to a wider consumer base. The challenge that will present the Dune players is how they evolve in the coming year(s). Online content (such as Netflix) is becoming more important (emphasis on the U.S market), and if more media players continue to add online content Dune runs the risk of being left behind. There is also Cinavia looming and the question of how it will impact the current and future Dune players. A simple solution for the bland stock UI would be to more tightly integrate the 3rd party jukeboxes into the UI (the easiest way would be to allow the user to have the Dune load directly into the jukebox of their choice). Overall they have a winner with the Smart D1 and others in the Smart series. Continued work should be focused on forging online content partnerships, enhancing the stock UI, and bringing new features to their players (such as source direct, mkv chapter support, and mkv forced subtitle support to name a few). Overall the Smart D1 does not disappoint.